Fibre, oil and starch - what's best for boosting your horse's condition? The long, cold winter has taken its toll, the grass is non-existent, and your horse is getting bored with his hay. You want to improve his condition and boost his energy, so you reach for a traditional conditioning feed, but is this really the best idea? Clare Barfoot, registered nutritionist at SPILLERS explains why you should hold off on feeding too much cereal starch and reach for oil and fibre instead. To build your horse's condition, you need to supply calories beyond those needed for maintenance, alongside quality protein to help develop muscle, topline. A traditional conditioning feed might jump off the shelf at you because it says exactly what you're looking for you right there on the bag, but here’s the question: is what’s inside going to be the best bet for your horse? All conditioning mixes contain cereals and the downside of cereals is that they contain high levels of starch. While this can result in the turbo injection of extra energy you need, it can also generate unwanted and perhaps unmanageable fizz in some horses and ponies. Starch may also contribute to fractious behaviour if you feed it in high quantities as it can overwhelm your horse’s digestive system. This causes acidity in the hindgut, which can lead to discomfort. Instead, step across the aisle to the fibre-based feed options and your horse will thank you for it. Supplying extra energy from fibre and oil rather than cereals, allows the energy to be released and used more slowly, helping to reduce the risk of excitable behaviour. It’s also great way to help build condition and shine, safely. Fibre is often seen as just a filler but it can be much more than that. Fermentable, highly-digestible fibre sources such as alfalfa and soya hulls can make a safe contribution to energy needs. Fibre is fermented in the hindgut relatively slowly, so it doesn’t cause the peaks and troughs in blood glucose that some horses may react to. Oil can be used to top up the calorie level in the diet - it contains 2.5 times more energy than the same weight of cereals and it's digested very efficiently. By fine-tuning the fibre and oil blend, you can deliver exactly the right type of energy your horse needs, when he needs it. This approach to feeding will also improve your horse’s health, quality of life and coat sheen. From a physical point of view, 65% of your horse’s digestive system (the hindgut) is devoted to processing fibre. From a psychological point of view, your horse has evolved to eat for approximately 16-18 hours of every day. In the wild, this diet would have comprised of grasses, herbs, plants and shrubs. Look out for feeds that contain extra oil and that supply optimum levels of vitamins especially vitamin E, which is needed when you're feeding higher levels of oil. Feeds containing chelated trace elements such as zinc and copper may also help promote coat condition. If you have a poor doer, a horse that's a fuss pot, or simply want to add a little extra safe conditioning nutrition into every feed, SPILLERS® Conditioning Fibre should be at the top of your horse’s menu. Designed to complement traditional feeds and balancers, this superior blend of soft natural fibres and oil produces fast visible results without excitability. It's also enriched with vitamins and minerals to provide more nutrition per scoop. 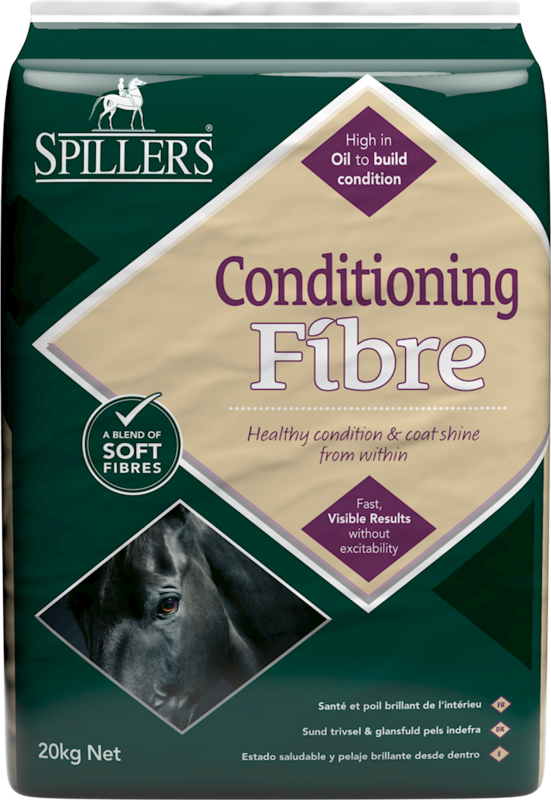 Find out what our dine and shine triallists think about SPILLERS® Conditioning Fibre, straight from the horse’s mouth. Zavir is a very high-energy horse with a rather hot temperament. We’re successfully competing at PSG and FEI Inter I level so he needs a good level of energy. He’s not a good doer so it has always been difficult to keep him looking as good in the winter as he does during spring and summer. He usually only picks at hard feed, but he absolutely loves the Conditioning Fibre and there’s always only a licked bowl remaining! Tom has been my best friend for 25 years now and is a fantastic 31 years young. He’s been retired for eight years due to COPD, Cushing’s and arthritis, but he truly loves life. This is the first winter that he’s dropped a little condition and needed to gain some weight. I tried all the slop-type feeds but he refuses to eat any of them! I also tried the alfalfa-type feeds, but he wasn’t keen on those either and would just pick at them. I wasn’t sure if he’d eat the Conditioning Fibre as he really is fussy but I was very pleasantly surprised! There was no change in his overall behaviour, but he does seem to be enjoying his dinner much more. Holly was a rescue case and when I got her she was given a body condition score of 1. She’s a very fussy eater and I struggled to find anything conditioning that she would eat. She also has bad teeth so struggled with chaff. She was very lethargic and depressed. After trialling the Conditioning Fibre, my mare is a different pony – full of energy, always looks forward to feed time where she eats the lot and licks out the bowl!